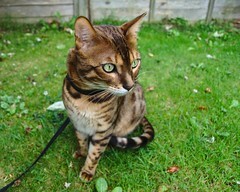 Loki is a brown-spotted pedigree Bengal cat who has lived with me since 2012 – I got him when he was 3 months old. 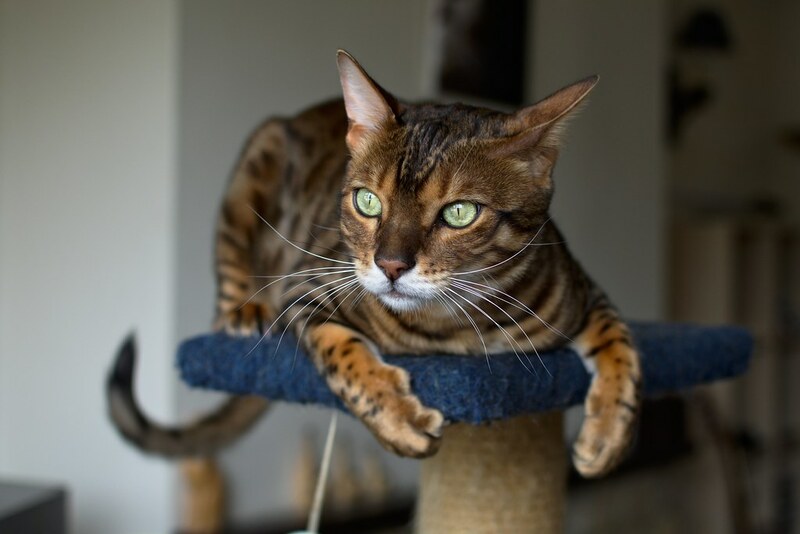 He came from Zawadi Bengals – a breeder I can thoroughly recommend as Connie takes great care of her cats and, as well as being very knowledgeable about the breed herself, she’s keen to ensure any prospective owner is as well informed as possible. 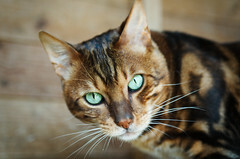 My favourite breed for many years has been the Abyssinian (and still is), but I was interested in other breeds with similar interactive temperaments and the Bengal breed had caught my eye. 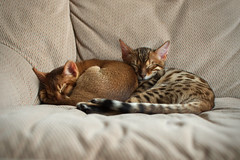 When Simba sadly passed away in 2012 I knew I would want to get another Abyssinian, but I also figured that my remaining older female cat, Misty, may not appreciate the playful attentions of a kitten – so I decided it would be a good idea to get a play mate for any new Abyssinian. 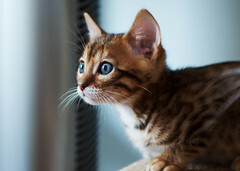 There were a lot more choices for Bengal kittens than Abyssinian, and prior to reserving the Abyssinian kitten (Theo) I did make enquiries of a few Bengal breeders and visited one, but wasn’t too impressed by the one I visited as the runs were a bit small. Then once I’d found and reserved Theo I looked at a few more breeders, aiming to find a kitten which would be ready when Theo was and about the same age so I could get them both at the same time in the hope they’d bond like litter-mates. As luck would have it Zawadi Bengals had a litter with only a week’s age difference to Theo and two kittens still available, so I made an appointment for myself and my partner to visit and meet them. It was a lovely visit to Zawadi. As mentioned above, Connie cares a lot about her cats and the breed, and she is very knowledgeable. She asked use to use a hand sanitiser on arrival so we could safely pet any cats or kittens without risk of bringing in any bugs and then sat us down to talk about the breed, find out how much we knew and fill us in a bit more about the breed and also about Zawadi. We then go to go out and see the runs for the studs in the garden. 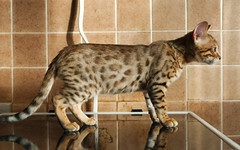 I was very impressed with the size of the runs (especially compared to the other Bengal breeder I’d visited), and she had exercise wheels in the runs as well. In particular we saw the run containing Loki’s dad, Basil (Seregon Basil Rathbone), and I got to go in and meet him. 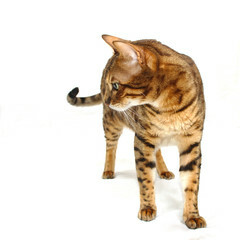 Basil was a strapping 7kg muscley brown-marbled male Bengal with stunning green eyes. I suspect Connie was partly observing how I would be with such a large cat – I remember when I visited Abyssinian breeders many years previously that one of the breeders introduced me to a large male Aby in part to see how I’d handle the attentions of strong cat – I always think it’s a good clear sign of a breeder that cares about the cats! Basil was friendly, in fantastic condition (as you’d expect for an Imperial Grand Champion!) and it was lovely to meet him and fuss over him. Next it was time to go meet the litter and their mum, safely tucked away in a bedroom upstairs. 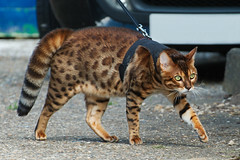 The mum, Zawadi Lolitabelle, is a brown-spotted Bengal. Most of the kittens emerged and were up on to the bed straight away to chase the toy which Connie waved for them, but one was a little more relaxed about making his way there, hopping up next to mum first to watch the others – that was Loki. I took a photo of mum with Loki in the background which you can see on the right. Loki did, of course, join in with the play with the other kittens in short order. He was one of two kittens available so myself and my partner watched them and played with them to decide if we wanted to give one a home, and which one. 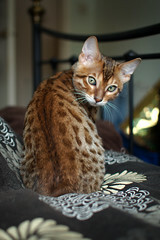 Connie gave myself and my partner a little time to chat, and we quickly decided we would reserved the lovely Loki. As you’d expect time seem to pass really slowly for the following month until it was time to collect Theo and Loki. We collected Theo first, as it was the longest drive to fetch him, then collecting Loki the following day. Loki had grown a lot in the month since I’d last seen him, and was a good solid weight already, and his eye colour had already changed from the blue to be greenish, although it wasn’t yet settled on its final colour. Having chatted to Connie about how to do the introductions, and as both Theo and Loki were kittens (so much more adaptable than adult cats), I decided to keep Loki in the carrier at first in the room Theo was being kept in, and then let him out and let them sort it out amongst themselves. As you’d expect there was some hissing and tail fluffing at first, with Loki being more wary as he was the second to arrive, but no aggression. I played with both and it wasn’t long before they were playing with one another. The introduction to Misty went ok. 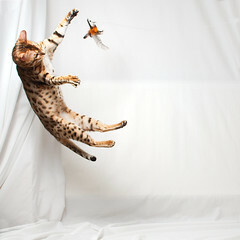 It was helped by introducing kittens to an adult – the kittens wouldn’t try and assert themselves or pushy Misty around. Loki was inquisitive about Misty, but Misty wasn’t happy about the kittens coming near her and she’d hiss at them (standing her ground until her point was made before wandering off). It was going to be slow progress for her being able to tolerate the kittens being near. Most positively the two kittens bonded as I’d hoped they would and it didn’t take long, only a few days, before Loki and Theo would curl up next to one another sometimes to nap. 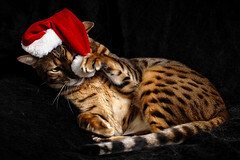 Some Abyssinian breeders had been very concerned when I mentioned I was thinking of also getting a Bengal – concern about the Bengal dominating and bullying the Aby – however Loki is a later generation Bengal and prior to getting the kittens I also had an email conversation with Simba’s breeder and she has bred and kept both (and was very involved in the clubs for both breeds) and she had no concerns. Loki’s relationship to Theo has stayed reasonably consistent. They still chase and wrestle 2 years on, although it tends to be Loki who’s more up for games and tends to initiate the wrestling. He does have a 1kg weight advantage over Theo, and there is a little bit of a dominating edge creep in to the wrestle once in a while, but Theo is very tenacious and will swat at Loki this his claws and squeal if it’s getting a bit much for him so it’s turned into a serious fight and there have never been any injuries from their tussles. They also still curl up together daily and will groom one another (the grooming sometimes turns into a little bit of a bitey tussle, never serious). 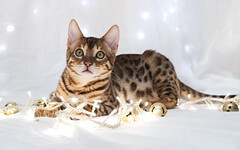 The Bengal breed is a high energy breed, and Loki lives up to that. Of course he still spends plenty of time napping during the day, but he also does like to burn off some energy and be entertained. Theo provides some of that entertainment and exercise, as mentioned above, and I also have plenty of cat climbing trees for him to jump up. I kept Simba and Misty as mostly indoor cats, and I decided to do the same with Loki and Theo. 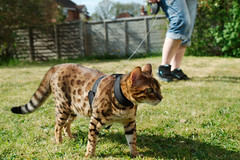 In fact due to the Bengal temperament I doubted Loki would be content to keep himself to the front garden, but I’d heard the Bengal breed takes really well to being walked so I thought I’d give that a go (to safely see how he was outside, and if he was inquisitive and roaming in nature such that I could walk him to allow him to safely explore). 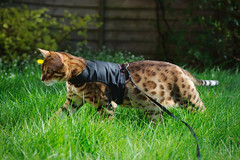 I bought a walking jacket from Mynwood Cat Jackets and a long Flexi Classic leash. 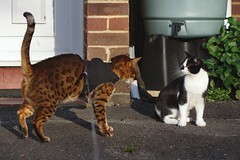 Loki was fine with the jacket within minutes – a real success – and although naturally cautious when first exposed to outside he was soon exploring the front garden. 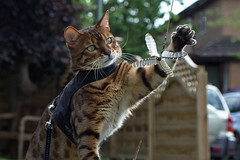 It was clear he’d be somewhat of an inquisitive explorer, so I continue to use the leash and jacket when he’s outside, but I take him out for a walk every day and he really enjoys it. Unsurprisingly it’s not like walking a dog, it’s more like guided exploring – I stop him getting into people’s front gardens and keep him from out of the road (he’s still not really developed enough sense of the danger of cars, another good reason to stick to the leash). On a couple of occasions relatively early on we did make it to some local woods near the end of the road, but since then he’s content to slowly explore nearer. Any neighbour’s cat we encounter will get treated to Loki fluffing his tail, arching his back and crab walking towards them with his head tilted. 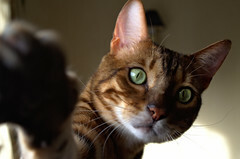 It’s all for show though – if the other cat stands their ground Loki will sniff them and yowl at them but he won’t attack and will even adopt a submissive posture with some of them. If the other cat runs he will want to give chase – my next door neighbour’s cat, Rosie, always runs and as a result he’s developed a bit of an obsession with her (which extends to him making a right fuss indoors when he spies her through the window). He often does respond to my hints with me tugging on the leash (with the walking jacket it pulls on his chest rather than his neck) and I can also sometimes get him to run towards me by crouching down and holding out my hand, so I can guide the direction we walk in to a degree. 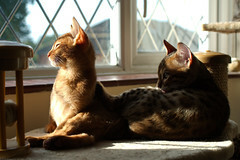 I wasn’t into photography when Simba and Misty were kittens, so I don’t have many kitten photos of them. By contrast I have quite a lot of photos of Theo and Loki and I thought it would be good to try do a bit more in the way of action photography, especially with Loki being so acrobatic. 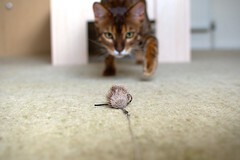 To encourage the kittens to be active in front of the camera I knew some cat toys would be a good idea. After a bit of research online I discovered the Frenzy range of wand toys and thought I’d give those a go and they’ve turned out to be excellent. In fact some of my action shots have been used, with my permission, in some of the Frenzy on-line and printed materials so you may recognise Theo and Loki there. 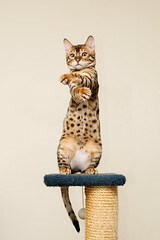 It’s common for Bengals to do a mid-air somersault when jumping for toys, and Loki enjoys doing that trick as well. Unfortunately because he can get quite a bit of high it’s really hard to judge where to aim the camera for action shots so I have many shots where Loki hasn’t been quite in frame! Loki has always been one for wanting attention on his terms. On his first day he wasn’t interested in human interaction until I thoroughly ignored ignored him for long enough, and then he decided he’d do a bit of purring and kneading. From his young days he will enjoy a little bit of stroking and being fussed over, but still on his terms, and he’s not one for being picked up (he will grumble and wriggle). As a kitten Loki did curl up on my lap a couple of times, but it’s not really something he was into and he’s obviously a bit big now so he’s not a lap cat. He does like to curl up next to me once in a while on the sofa, and when it’s cold he’ll paw at my side until I arch my back to make room for him to lie just behind me (with a cushion behind the middle of the back there’s room for him to be nice and warm just below it, and my lower back to be nice and warm). 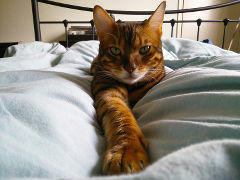 He also likes to curl up on top of the duvet at night resting against me or in the valley between my legs, which is lovely in winter but can be a bit too warm in summer! He doesn’t purr very often, and the purr he initially had as a young kitten has softened to be almost inaudible, but it’s very sweet when you do get that very subtle hint of purr when he’s in a particularly affectionate mood. 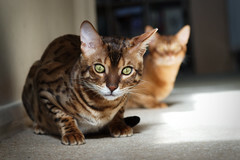 Bengals have a reputation for being quite vocal, and Loki can be chatty at times, with occasional episodes of shouting at the corners of the room or at cats he can see through the window. Thankfully he does quieten down at night, which is a relief! One of the noises he makes sometimes reminds me a little of a bird of prey call! As well as miaowing and yowling he can also chirp, sometimes with a little huffing noise on the chirp when he’s in an affectionate interactive mood. He’s got a particular shout he uses as well when he wants some extra food (which he deploys from near the cat bowl). As mentioned earlier his purr, however, is very very quiet. I’m really happy that he’s a part of the family and look forward to many happy years together.